Yesterday I spilt a huge bottle of tea on my laptop’s keyboard… I’m using a replacement PC for the time being, but all my settings are missing making it rather difficult! 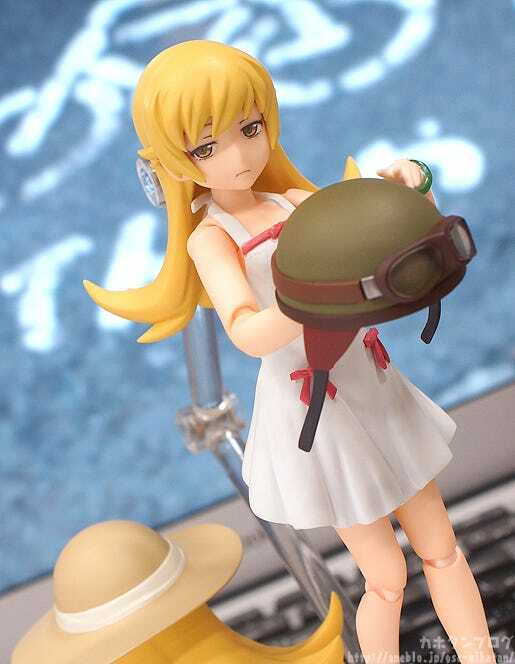 From the ‘Monogatari’ anime series comes a figFIX of the once legendary vampire, Shinobu Oshino! A faithful rendition of Shinobu’s well-known sitting pose from the classroom corner. Just look at that lovely glare!!! The planner of the the figure (IG Sakai: @sakai_max) really wanted to have Shinobu available in her sitting pose as well!! The way she is sitting with her hands under her legs is so adorable! The frills on the inner side of her one piece are also very cute! The detail is enough to make you forget that she is only around 1/12th scale in size! Here she is compared with an iPhone5 for comparison! Looking up close you’ll even notice the angle her toes are open at differ from left and right! I must however explain once again what figFIX is for those who might have missed out last time! My favorite thing about them is that you can swap expressions with the figma of the same character, and since figma Shinobu was announced on the same day you can easily pick them both up for a whole range of new options! 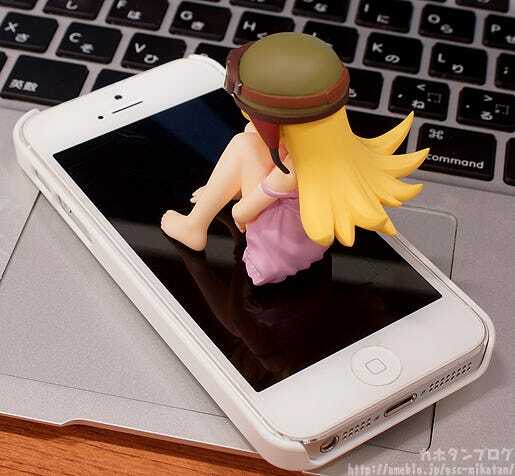 *Pose uses both an expression and hat from the figma! figFIX keep a bit of articulation on the neck part, which gives you a lot of different options as far as expressions go! She is up for preorder now! She looks so cute plonked down on the chair!! However! 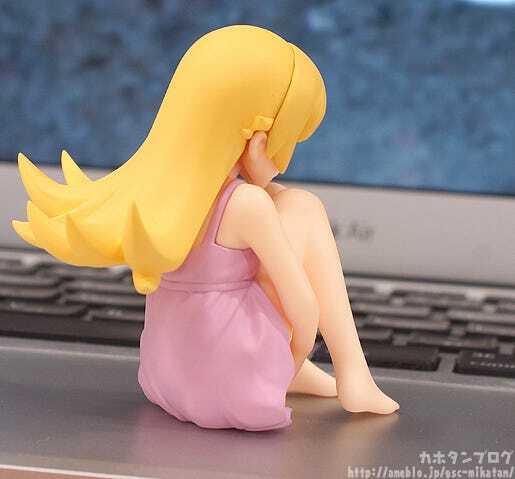 The image above is actually of the figmaPLUS chair… the version that comes with Shinobu will be a special design based on the Monogatari series! The actual design will be added to the product page at a later date, so check back soon! 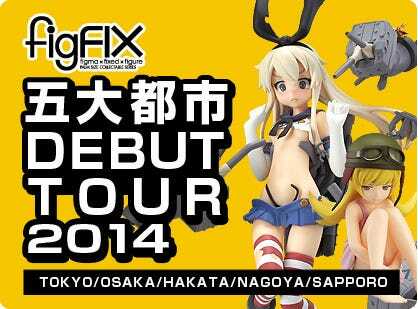 The figFIX Big City DEBUT TOUR 2014 will be headed around to Hobby Stores all over Japan! Anyone who comes by the stores during the tour can grab a figma Parts Packet: Docking ver. and figFIX Shimakaze postcard as a present! Plus any preorders of either of the two first figFIX figures made at the tour locations will comes with the GSC Online Preorder Bonuses! The figma Parts Packet: Docking ver. 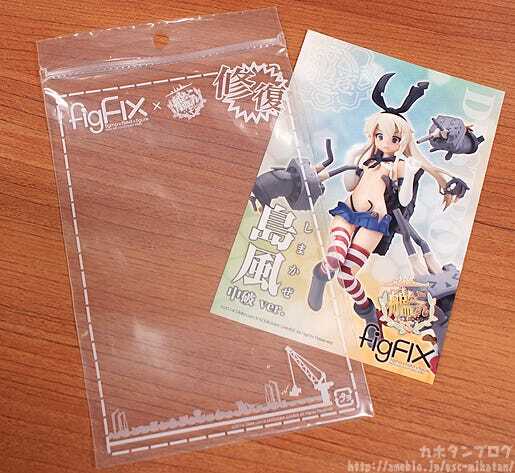 and figFIX Shimakaze postcard look like this! Definitely a nice little bag for admirals to store their spare figma and figFIX parts in! The reverse side of the postcard is a figFIX explanation! Simply head to the event stores and speak to the staff with Max Factory or GSC logos on their shirts and you can get these for free!! Limited to one per person though! *Please note that the blog published on the 16th September stated that ‘Hatsune Miku: Tell Your World’ clear files would be distributed at Magical Mirai Tokyo. Due to unforeseen circumstances these will no longer be available at the event. We apologise for any inconvenience caused.